Now you can catch America's favorite green teens in their first live-action blockbuster film! After wading in a puddle of radio-active waste, these radical reptiles are transformed into New York City's greatest crime-fighting quartet. Featuring a soundtrack by M.C. Hammer, this film will captivate adults and kids alike with its blend of humor, camaraderie and martial arts action. Don't miss this blockbuster movie. You'll have one shell of a good time! I only first saw this movie a few years ago. I didn't really know anything about the characters other than their names at that point. The characters actually first appeared in comic books and from what I read, the plot for the movie comes mainly from the comics instead of the cartoons. The plot is a bit silly, but it works for the movie and things are entertaining. There is a decent amount of action to what is going on and that does help to keep the pace moving. There is a little bit of violence that isn't that graphic. The movie works well as an entertaining family friendly movie. Children may enjoy it more than adults. Most of the characters are animals who can talk. There are costumes for the turtles that were created by Jim Henson's Creature Shop. The costumes do look a bit odd, but they work well. The movie is a bit silly, but it works as a fun, entertaining movie. This nails it for me. It's cheesy as hell but it is fun and at times is even quite dark in nature. 2 and 3 aren't total crapshoots either but maybe that's because the Turtles are my era from childhood. 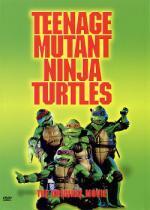 I have TMNT but not yet got around to watching it and I'm looking forward to the recently announced upcoming live action movie. Thanks for the review. I feel exactly the same about this. A lot might call it a guilty pleasure, but I don't like that term. If you like it, so what? It is very silly, but something about it works. I haven't seen the second movie yet. I saw the DVD in walmart for $5 not that long ago..I actually looked tonight, thinking I would pick it up, but I didn't see it. I think I might have seen a little bit of the third movie on tv once..not sure though. I have seen TMNT and I liked that one. Ack. Well. I may need to get my courage up to watch it in that case. Though I still have to find the DVD first. Never seen any of the movies. We only got the cartoons on TV in the aftermath of the movies (IIRC) and I was "too old" when they came out. I think the cartoons actually started before the movie. I only saw them on TV after. But this was in Germany ; I do think indeed they were crfeated before the film(s). Oh and don't forget when April is in prison and it shows Caseys ancestor, then flips to a image of a rat on the floor.... I guess they are implying that hes Splinters ancestor too. The can't get up thing would be funny, like he's pretending to be a normal turtle, but it all depends on delivery. Not sure I'll bother! I love the first two movies, they're so bad they're good.